This third volume tells of the years 1931 to 1939. It fulfils the dual role of a serious historical work and the telling of good stories. Each of the years is written as a narrative that grips the reader’s attention. The 438 pages are lit up by no fewer than 500 photographs. Much of the material has not been published before. 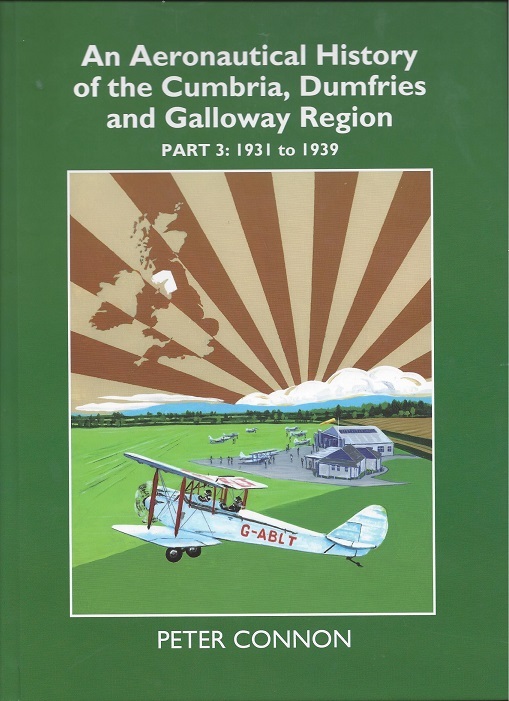 An Aeronautical History of the Cumbria, Dumfries and Galloway Region. Part 3: 1931 to 1939 by Peter Connon. Published by Peter Connon. £39.95. This is a monumental work. A work of incredible dedication and scholarship. A work that is the result of more than forty years of devoted, obsessive research. Peter Connon has, single-handedly, written the definitive history of aeronautics in Cumbria, Dumfries and Galloway. In Volume One – In the Shadow of an Eagle's Wing, which was published 35 years ago - Peter dealt with the history of aviation from 1825 to the start of the First World War. Two years later, he published the second volume continuing the history to 1930. This, the third volume, justifies the wait. In over half a million words and with many photographs and diagrams, Peter has continued the story to the start of the Second World War. The thirties were an exciting time in aviation. It was a golden age when “pilots had almost total freedom of the skies navigating by Bradshaw, following the railway lines and noting station names”. It was an age of enterprise and adventure, the last decade, when, with little legislation and restriction, the private aeronaut could commit himself to an activity, which, though inherently safe, was “terribly unforgiving of any carelessness, incapacity or neglect”. They were exciting days. In 1932, the great event was the airshow which Sir Alan Cobham held at Orton Park. M.N.Hearn “stood on the top mainplane of Avro 504K G-ABH1 holding a strap and waving with his free hand as Captain P Phillips dived the aircraft to within one hundred feet of the crowds. He then sat unrestrained on the top wing with his legs dangling over the leading edge whilst waving both hands above his head.” Hearn wasn't finished. Captain Phillips chose to loop the loop and Hearn stood on the central skid holding on with one hand and waving to the crowd with his free hand. One of the many spectators was fifteen year old Archie Winskill, a pupil at Carlisle Grammar School. He was so thrilled by the flying that he resolved to become a pilot. 73 years later, having distinguished himself in the war and having captained of the Queen's Flight for fourteen years, Air Commodore Sir Archibald Little Winskill KCVO CBE DFC and bar died on 9th August, 2005. At the end of 1939, private aircraft were being requisitioned for the war effort. The Border Flying Club's three Gypsy Moths were flown to 22 MU Silloth “for storage pending allocation”. Accidents occurred. On 29th November, 21-year-old P/O W.C. Hoey was landing a Wellington L4388 at Silloth airfield after an air firing mission off the Isle of Man. As he came in to land his aircraft glided much more than usual, one wheel “got bogged” and the Wellington swung into the fuselage of a second Wellington standing by the hangar. There is a photograph of the two damaged aircraft with the skidmarks from Hoey's Wellington clearly visible. It is this remarkable level of detail that makes Peter Connon's book so valuable. Not only does he record every flying incident and event, but he is able to provide significant facts about the participants and their later lives and a great detail of documentary evidence. It is a book that no researcher on the history of aviation can afford to ignore. In his Introduction, Air Chief Marshall Sir John Allison KCB, CBE, whilst describing the work as “the definitive reference book”, also praises the way “it gives insight into the lives of numerous people, conveying through these lives the endeavour, enthusiasm and, often, courage with which they pursued their dreams in aviation”. The publication of this book fulfils a dream which Peter Connon first had over forty years ago.